Beef jerky is an amazing food. It tastes great, is a good source of protein, fits into every Paleo diet, and will last for a while. Also, if you’re camping, hiking, or on the move, beef jerky is easy to store and doesn’t need any TLC to stay fresh and keep tasting great. My wife and I love it. But we don’t like all the extra chemicals that come with the store-brand stuff. So we set out to learn how to make beef jerky ourselves, without buying any new equipment or fancy gear. Here’s what we discovered — you’re going to LOVE this! 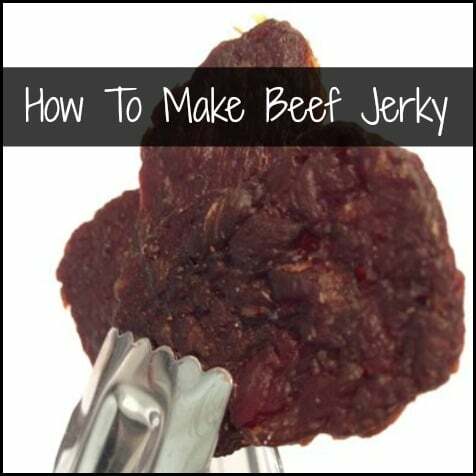 This is a very easy and inexpensive way to make beef jerky that tastes great. You want to make sure that the meat you select is as lean as possible. Fat makes your jerky go rancid much faster, and it won’t dry or cure the same way the meat will. Fat also won’t absorb your tasty marinade properly. Once you’ve selected a lean cut of meat, pop it into the freezer for an hour or two. This will firm it up and make cutting it easier. Beef jerky will shrink about 1/3 of its size when you’re done, so you don’t want to cut your strips too thin or too small. Also, cutting your meat into strips that are too thick will make your drying time longer. Stay around 1/8″ thick when cutting your jerky strips. Getting the best size for your needs might take a little trial and error. But no matter what, when you’re done, it will still taste great! If you notice any big areas of fat in your jerky strips, now’s a good time to remove them. Mix the marinade in a large bowl. Then soak the meat in the marinade overnight in the refrigerator. Next, remove any excess marinade from the meat with a paper towel. This will help speed up drying time. Now it’s time to put the meat into the oven. Put the meat slices on your oven racks. It’s OK if the slices touch, but don’t overlap them. You might want to put aluminum foil underneath the meat, as the marinade will drip. Set your oven on low heat (around 180 degrees) and prop the oven door open a bit to let some of the heat out. We’re drying the meat. Not cooking it. You’re going to leave this drying for several hours. The amount of time you’ll need depends on the thickness and size of the meat, and the temperature of your oven. When the beef jerky is dry to the touch, is still a little bendable but can be easily ripped apart, you’re done.